Mobile commerce is really hitting its stride. It seems like every day I see new mobile commerce articles on Internet Retailer. Check back soon for an EasyAsk customer success story on mobile commerce with EasyAsk. One of the big issues with mobile commerce is optimizing the user experience. EasyAsk’s partner in mobile commerce, Unbound Commerce, has tremendous experience with mobile user experience and has contributed greatly to EasyAsk eCommerce Mobile. I was talking with the team from Unbound Commerce last week and told them of an experience I had with a mobile travel site (I’ll leave the site name out). The navigation on the mobile travel site made it so difficult to narrow my flight choices and find what I was looking for, that I became frustrated and gave up. The Unbound Commerce team told me that navigation can often be overlooked in the mobile world. In some cases, navigation can be more important than search. That was a revelation to me. But in retrospect it makes perfect sense. The screen real estate on a mobile browser is vastly smaller than that on a PC or Mac. This says that excellent search is critical. You need pinpoint search results because wading through pages of results in a mobile browser would frustrate a user and cause them to abandon. But excellent navigation is also important due to the screen real estate constraints. Using richer, dynamic search criteria in the navigation, such as product attributes, rather than just the static categories, allows visitors to refine their choices faster and easier. More importantly, this allows visitors to find products in 1 to 2 clicks, rather than plowing through pages of categories – increasing the chances of conversion. So, something to keep in mind when exploring mobile commerce solutions: you want to offer pinpoint search and rich, dynamic navigational attributes. The Gap has been a long time user of EasyAsk eCommerce Edition in the main Gap.com e-commerce site and many of the company’s other brand sites such as Old Navy, Banana Republic, Piperlime. EasyAsk and OEM partner Infor Corporation ran a webinar earlier this week titled EasyAsk Commerce Studio for Infor Storefront Customers. The webinar has a great interview of an Infor – EasyAsk customer, Tenaquip, and provides a great demonstration of EasyAsk Commerce Studio functionality. The EasyAsk Search and Navigation engine is built into Infor Storefront to deliver rich, natural language search. Infor Storefront customers can separately purchase the EasyAsk Commerce Studio to take advantage of this easy-to-use tool to tune and manage the e-commerce search environment and create compelling, timely merchandising offers and promotions inside Infor Storefront. BURLINGTON, MA—MAY 3, 2011—Anyone who has ever searched for the proper ink cartridges for their printer model can tell you about the dizzying array of options and combinations that can quickly frustrate a buyer. Using EasyAsk eCommerce edition, InkJet Superstore has dramatically simplified finding the right printer cartridges and accessories, providing the easiest online experience for customers, increasing online orders and revenue. InkjetSuperstore.com sells toner and ink cartridges for virtually every make and model of printer, copier, and fax machine, with over 6,000 items. InkJet Superstore’s vision is clearly articulated on the company website: “To be the best, the easiest, the cheapest and friendliest place to buy printer accessories.” To back this up, InkJet Superstore offers a 100% satisfaction guarantee, which includes paying for return shipping cost. Search and Merchandising are a vital part of delivering the best customer experience and ensuring customer satisfaction. Because nearly one-third of all site visitors immediately go to the search box, delivering good search results on the first try is crucial. EasyAsk also enables InkjetSuperstore.com to manage an ever-growing catalog of ink and toner products. The automatic synchronization between the NetSuite-based product catalog and EasyAsk eCommerce search enables new products to more easily be assimilated into the website. The rich EasyAsk analytics also allow merchandisers to see new products in customer searches and quickly add these new products to inventory. 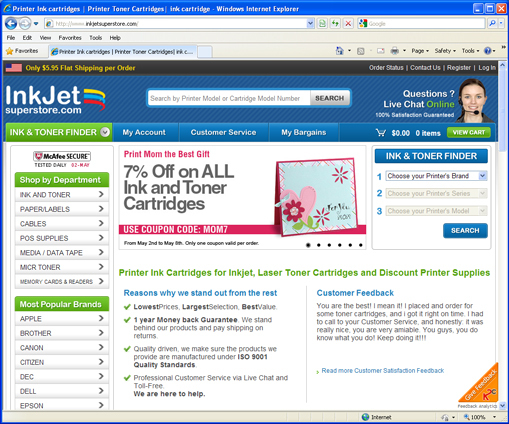 InkjetSuperstore.com launched its business in 2005 on the NetSuite platform, building its pure-play e-commerce operation around the NetSuite Ecommerce solution. NetSuite’s cloud enterprise suite gave InkJet Superstore all the capabilities the company needed to run their business, but required more sophisticated e-commerce search due to the complex relationships between printers, cartridges and accessories. The partnership formed between EasyAsk and NetSuite through the NetSuite Solution Developer Network enabled InkJet Superstore to find an integrated, best-in-class search solution for their NetSuite-based e-commerce platform. EasyAsk eCommerce Edition is the industry leading e-commerce search and merchandising solution that allows visitors to find products faster, and receive compelling promotions and offers. EasyAsk understands the content and intent of the search question – “red long sleeved dresses under $150” – to deliver the right results on the first page. EasyAsk eCommerce Edition customers see the industry’s highest conversion rates, deliver a superior customer experience, and see dramatic increases in average order sizes. EasyAsk is radically changing the speed and ease of how people find information through the company’s ground-breaking natural language search software. EasyAsk software products go far beyond traditional search, allowing users to simply ask questions in plain English and receive highly tuned results on demand. The EasyAsk eCommerce Edition uses this unique technology to deliver an industry leading website search, navigation and merchandising solutions that boosts online revenue through increased conversion rates, better customer experience and agile merchandising. Based in Burlington, Massachusetts, EasyAsk has long been a leader in natural language information analysis and delivery software. Customers such as Gap, Coldwater Creek, Hewlett Packard, Lands End, Lillian Vernon, Aramark, JJill, Nedbank, BNP Paribas, TruValue, Siemens, Hartford Hospital, Ceridian, JoAnn Fabrics and Harbor Freight Tools rely on the EasyAsk software products to run their business and e-commerce operations daily. For more information, please visit EasyAsk.